Overall, SynthMaster Player is a preset-packed, fun experience. Superb synth sounds. IAA/Audiobus support. MIDI keyboard compatible. Some presets' MIDI assignments are left blank and cannot be user-assigned. 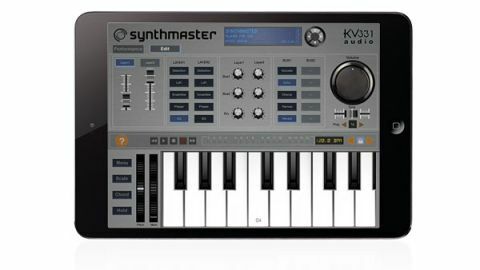 The creator of the versatile SynthMaster 2.5 desktop synth has embarked upon its first foray into the world of iOS apps, bringing the preset-based SynthMaster Player plugin to iPad. "This app is all about instant access to superb-quality synth sounds that will delight performers and producers alike"
The app itself is free, providing 100 presets, plus another 100 on registration. Users can then upgrade to the Pro version (£7.99 via In-App Purchase - but act fast and you can get it for £3.99 until 1 July) reviewed here, adding 800 more presets, and the ability to save modified presets and purchase more banks. Pro users who also own the SynthMaster PC/Mac plugin can download their preset banks for use. As a preset-based 'player', the app lacks the customisation of other synths, instead being geared towards quick access to expertly designed, tweakable presets. These sound impressive, covering a wide range of categories and all accessed via an intuitive browser. Presets feature up to two separate layers, each loaded with up to eight insert effects, plus two aux busses (with up to eight effects on each). These effects can only be turned on and off, unfortunately. The Performance tab features two X/Y pads and eight (MIDI assignable) 'easy knobs', preassigned to useful parameters. Adjusting these can provide heaps of sonic variety, though some presets' assignments are left blank and cannot be user-assigned. The keyboard has several handy performance options: Scale mode places dots over notes in one of 21 scales; Chord mode assigns one of ten chords to just a single note press; Hold keeps a note held until another is hit. An external MIDI keyboard can be hooked up, and other apps can be combined via Audiobus and Inter-App Audio. Veteran synthesists may balk at the lack of customisation, but this app is all about instant access to superb-quality synth sounds that will delight performers and producers alike. We advise upgrading to the Pro version to get the most out of the app.